Hi friends...hope you all had a fabulous Christmas. I tend to make cards with lots of 3 D elements especially flowers and when it's time to mail them it's always a challenge to pack them safely for the postal services! And that is why I just love Pop Up Cards. They can be made flat for mailing but still pack a punch !! 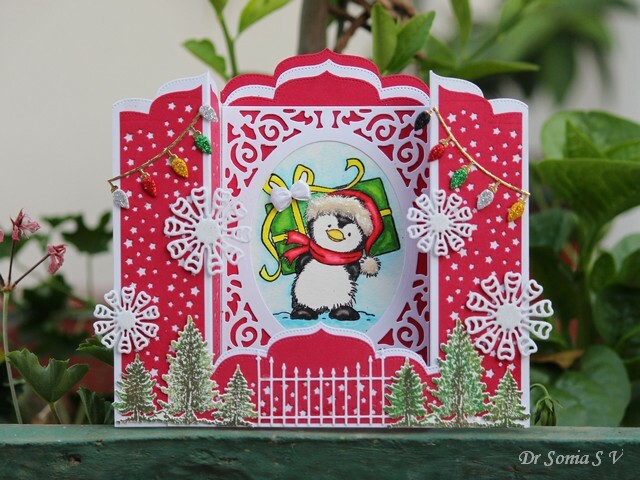 This is a card design whose Tutorial I shared in this post : Pop Up Card Tutorial . 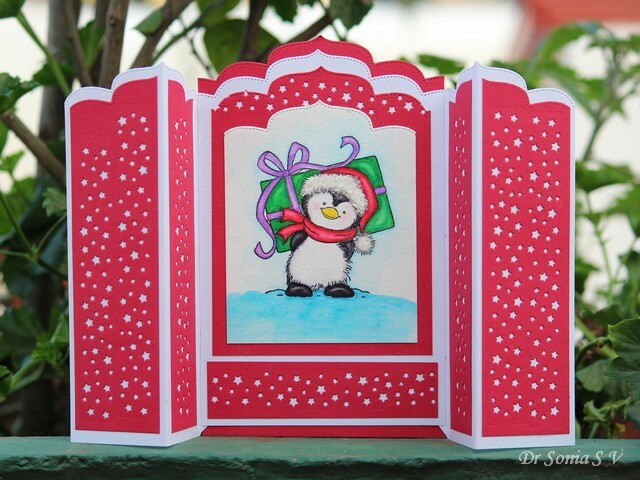 It is a simple card but because of the pop up style good enough to qualify as special!! Hi friends...hope you are all looking forward to celebrating the festive season and looking forward to the New Year. I have been super busy with renovations taking place at my home but excited to share a simple Pop Up Card tutorial with you . 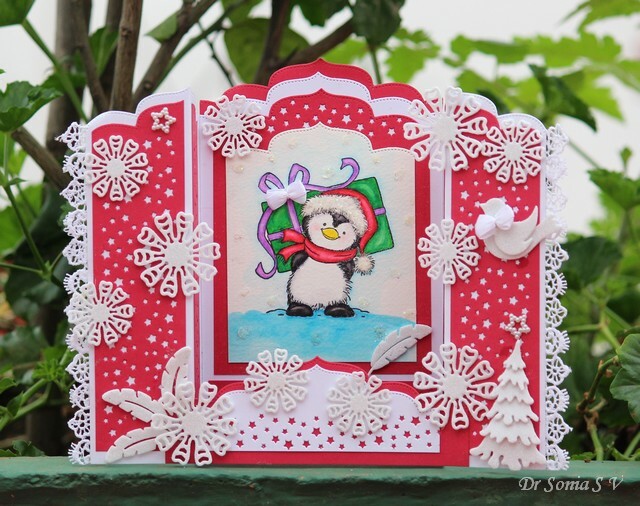 As a crafter it is a huge morale boost to be invited to be a guest designer ! And it is especially so when the honor comes all the way from the Netherlands !! This post is my Guest designer post for Crealies , a Netherlands based company [ with world wide clientele] which has some fabulous, unique and cleverly designed dies ! 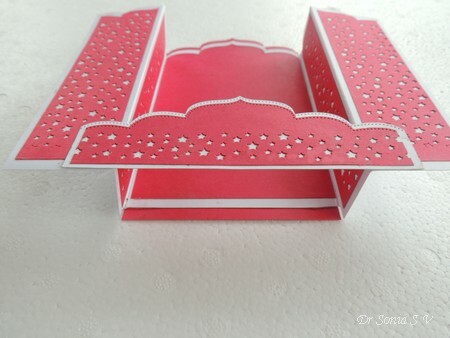 This Pop Up Card design goes by many names such a U card/bridge card etc. It has a central panel, side panels and a connecting bridge. It stands up beautifully like a box and the beauty of this design is that it can fold perfectly flat for mailing. 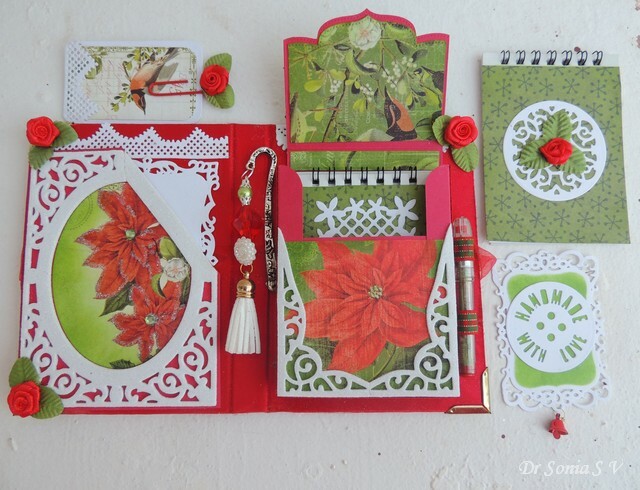 I have adapted the basic design idea using gorgeous Crealies dies. 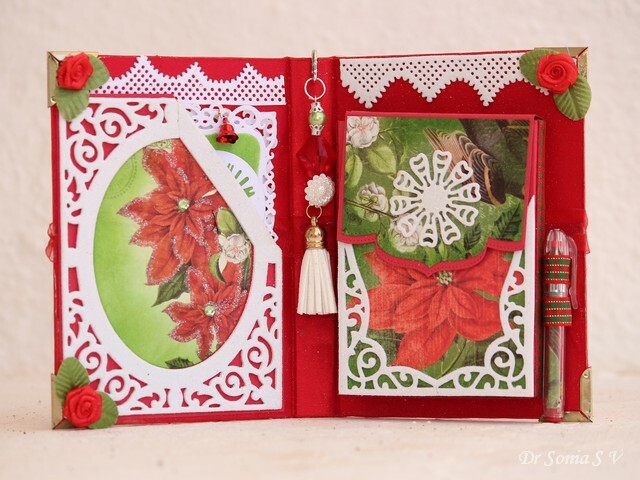 The border designs were made using Crealies On the Edge dies and the gorgeous starry design you can see in both the cards was created using Crealies Inside only Stars die.The shimmery snowflakes were made using glitter foam and the beautiful Crealies Duo Dies No 47,Flower 19. 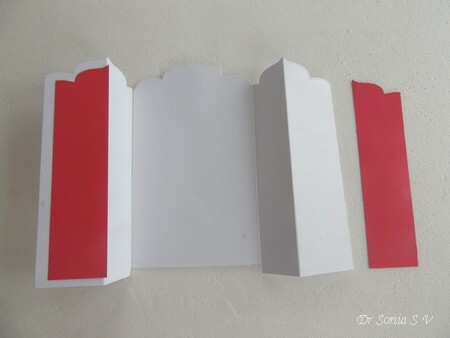 These Pop Up Cards can be made as elaborate as you want or with minimal embellishments and still pack a punch!! 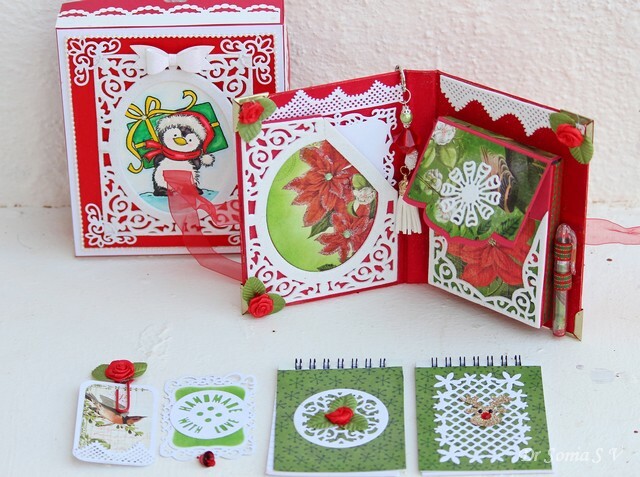 But if you have border punches or dies it is a fabulous card design to put them to good use. Central Panel : 4 1/2 x 6 1/2 inches. Two side Panels : 3 1/2 x 6 1/2 inches. 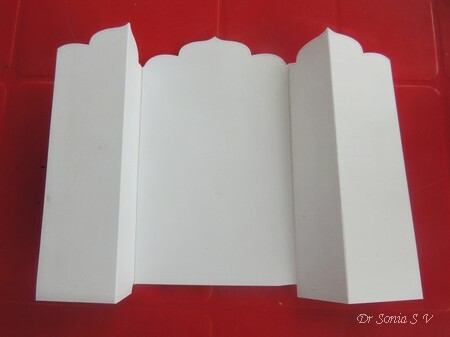 The Connecting Panel measures: 5 1/2 x 2 inches. 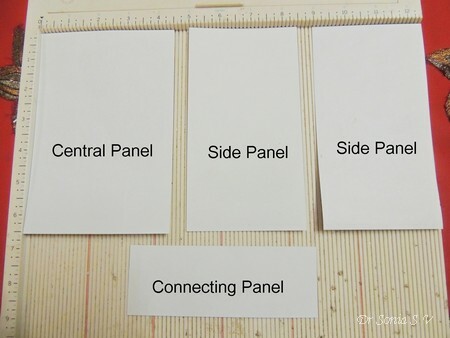 You can actually use one large piece f card stock for the central and side panels but if you are using a die / punch using separate pieces is easier. 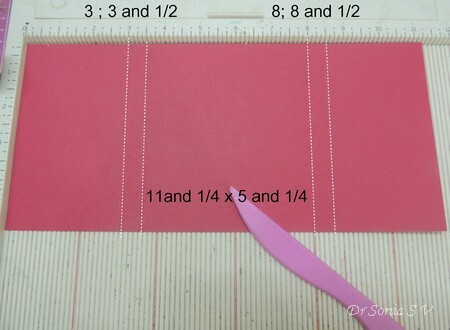 Step 1:Find the center of the edge of your card - you can mark using a centering ruler or more easily use a scoreboard if you have one.The 6 inch mark on your scoreboard is the easiest place to work with. Step 2: Line the Center of your "on the edge" die on the central mark on the card. Again if you have a scoreboard the die will fit snugly into the 6 inch score groove. Step 4: Tape the die on to the card using tape only on the die and the outer card edge which you will discard after die cutting. 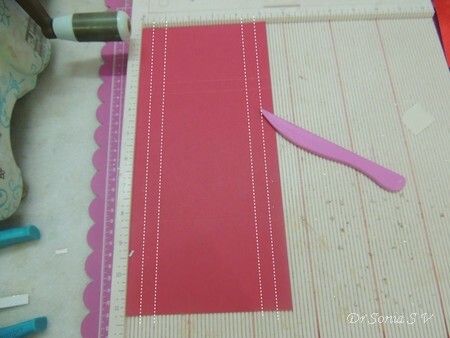 This way you will get perfect symmetrically aligned die cut borders which you can layer, create pockets and what not! 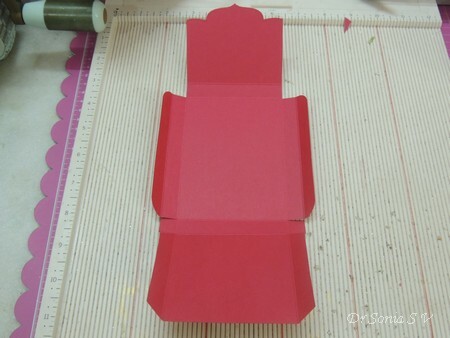 Glue the folded edges of the side panel behind the central panel adjusting where you want to glue depending on the border design you want.Your basic Pop Up Card base is done. 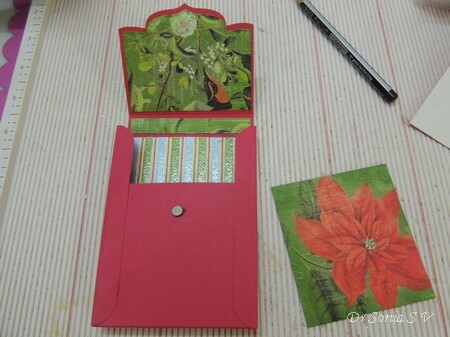 The side panels have an outer and inner part and you can decorate each with designer papers / other options. I used the beautiful "only inside" Crealies die designs to get the starry design. Here is a tip to get perfect "inside only" die cutting " : As you can see from the photo in the shorter part of the die cut the star "only inside" die is longer than the card stock...if you want the design to cut only inside position your top cutting plate only on the part you want the die to cut and run in through your machine ! 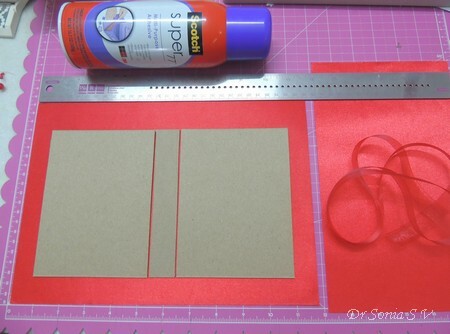 Optionally you can add a central backing panel in red measuring 4 x 7 inches. 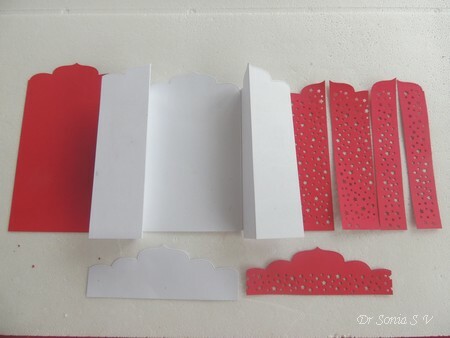 And here are all the elements die cut and ready to assemble into your Pop Up Card . 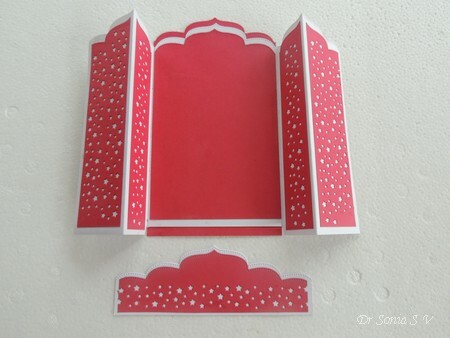 If you chose not to attach the connecting panel this is how the card will look like....a beautiful arched gate fold style card which stands nicely. 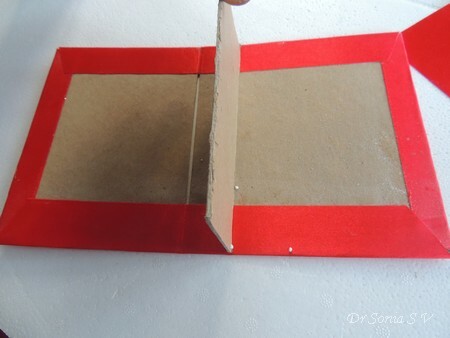 Fold one "side panel" on its fold and extend the other side panel . Position your connecting panel on the lower part of your cad to see where it overlaps on these side panels. 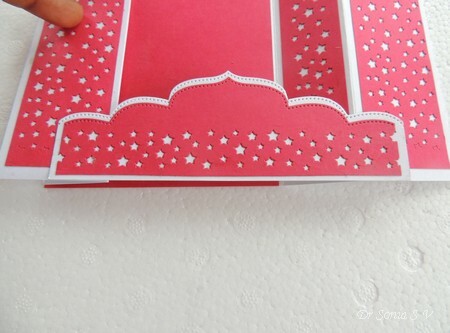 Apply glue on the edges of your connecting panel and glue it onto your folded card in a symmetrical manner...you can use the die cut border design on your card as an easy guide. 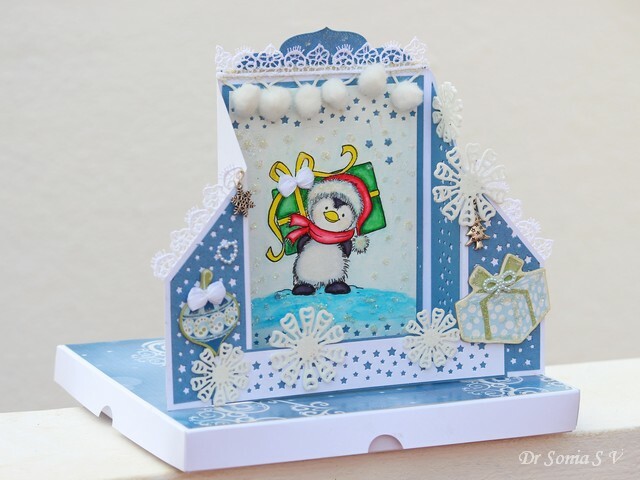 I hope you enjoyed the die cutting tips I have shared and the detailed Pop Up Card tutorial too. I loved working with the cleverly designed Crealies dies and it is such an honor to be a guest designer.Thank you so much Annelies and team! 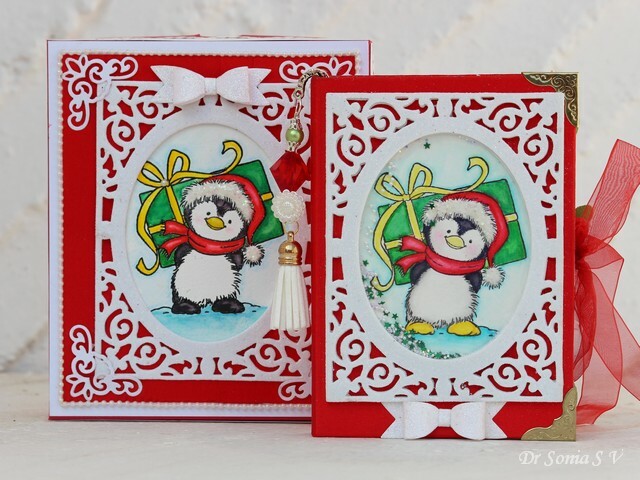 Simon Says Stamp Wednesday Challenge - Party Time- My penguin is going to the party with a present!! This card was featured at the Pixie Snippet playground. So honored!! Hi friends sharing a special handmade gift idea to make for that special someone whom you are certain will appreciate the value of a handmade gift and all the love you put into making it! On first glance it looks like a book with a beautiful dangling bookmark ! Well it is a special type of book-- it has a satin fabric cover and lining, a sturdy chipboard base, engraved metal corners, an organza ribbon fastening and a dimensional shimmery glitter foam shaker with the most adorable penguin!! On opening the book, one side has a pocket with space for tags , mini cards and a gift card if you wish.I made a simple ribbon rose bookmark on a jumbo paper clip to match the rest of the project. 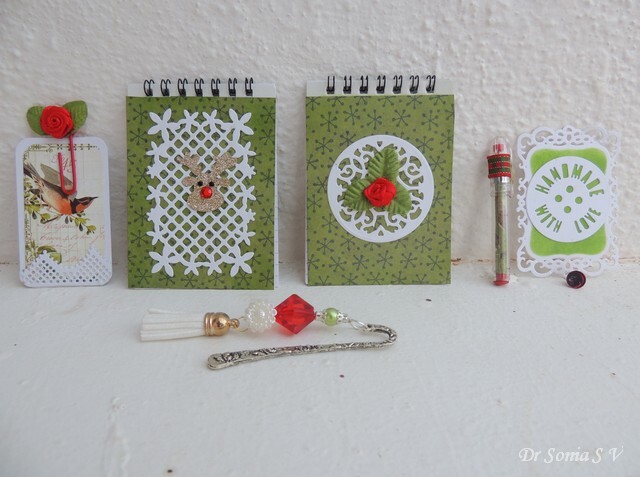 Added a festive red bell on the mini tag saying "handmade with love" ! 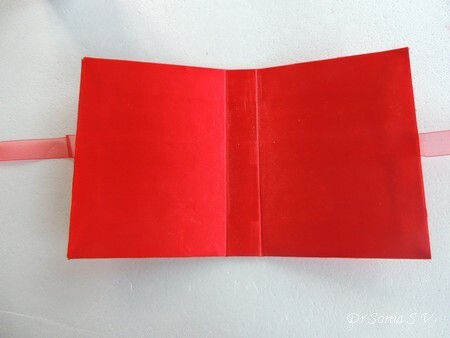 The pocket on the other side has a magnetic flap which on opening reveals 2 mini notebooks- one with a ribbon rose and the other with a glittery "Rudolf the red nosed reindeer"!! 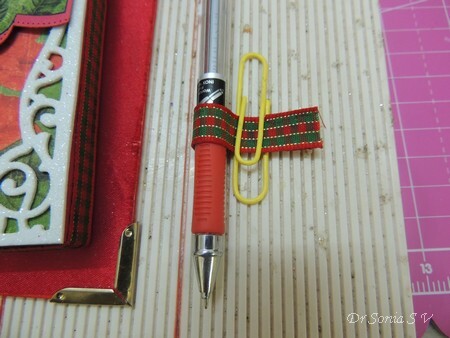 The little pen was dressed up with a festive ribbon band and fits snugly inside the pen holder made with matching ribbon. 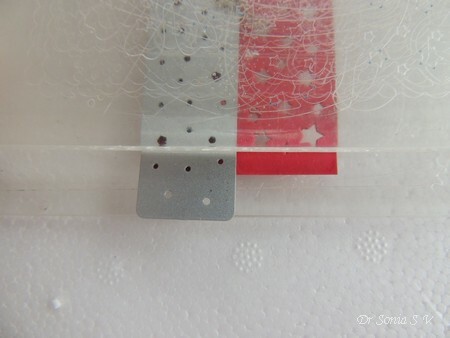 The metal bookmark was handmade using beads and a tassel in festive colors! The stationary set needed a fitting box so made a matching gift box featuring the same adorable Penguin colored using Staedtler watercolor pencils and Zig Watercolor Brush Pens . 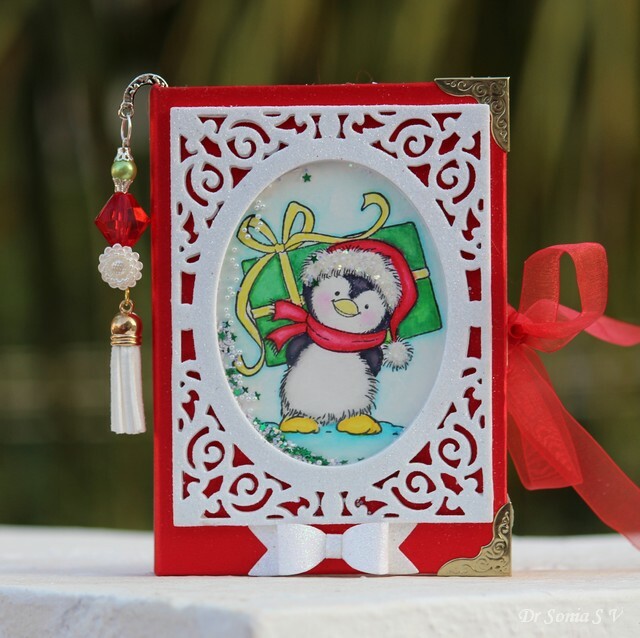 The cute penguin rests on gorgeous satin cloth and is framed in a shimmery glitter foam dimensional frame. If you are curious how I made it just breeze through the detailed Tutorial below and bookmark/pin it for later use ....or jump right down to the comments and tell me how you like this project! Making the "Book style Cover"
The construction of the cover is very similar to making a mini album cover with a few tricks you can use to up the oomph factor!!! Cover and Inner Lining: Use high quality paper/ leather /kraft tex[see this post : Kraft-tex Projects], fabric. I used paper lined satin sheets which added to the glamour coefficient! Good quality glue : I used Scotch adhesive spray which was super quick ,didnt wrap the fabric paper and gave fantastic adhesion. 4.5 x 6 inch with a 3/4 or 1 inch spine is a good size for the stationary set cover. 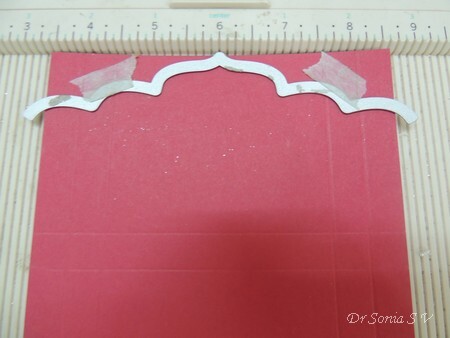 For this you need the following chipboard pieces:Two 4.5 x 6 inch and one 1x6 inch. 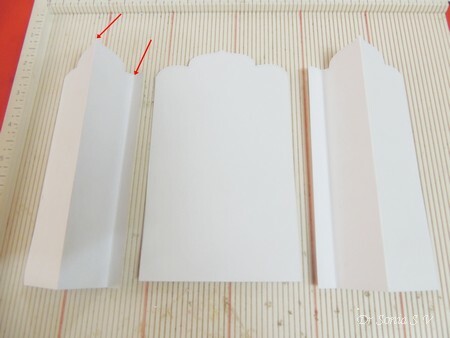 The outer satin paper should be large enough to give at least a 3/4 inch margin all around when you line up the chipboard pieces as shown above. Use at least 8 x 11.5 inch [A4 ] cover fabric/paper. The inner lining should be at least 6 x 10 inches. 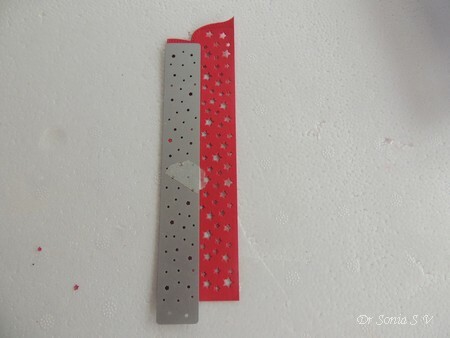 Stick the chipboard pieces one by one onto the back of your fabric cover. Since I used Scotch spray adhesive this was a super quick step for me. 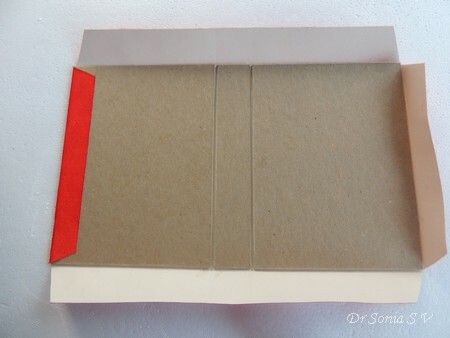 Use a spare chipboard piece and position it between your big chipboard pieces and spine piece while you glue so that you get a gap that will allow your book to close and open easily. 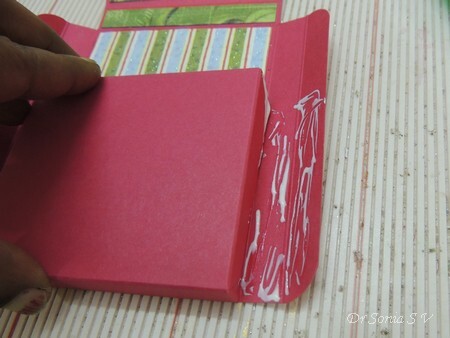 After gluing close and open the book so that the fabric stretches nicely. 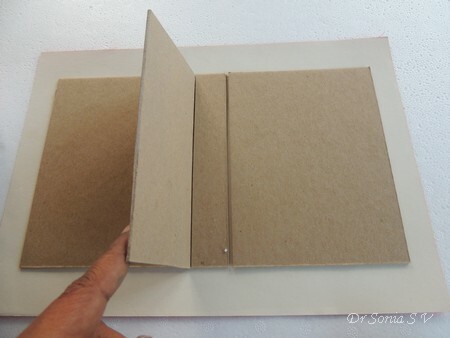 To ensure that you don't lose the flexibility of your book cover use a chipboard piece and use it to sort of score over the glued fabric in the gaps on either side of the spine. 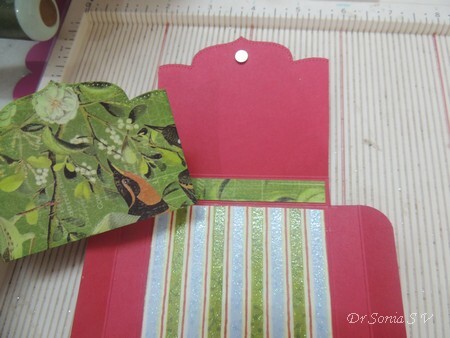 Now place your ribbon in the center of the book cover and glue on the 6 x 10 inner lining fabric. 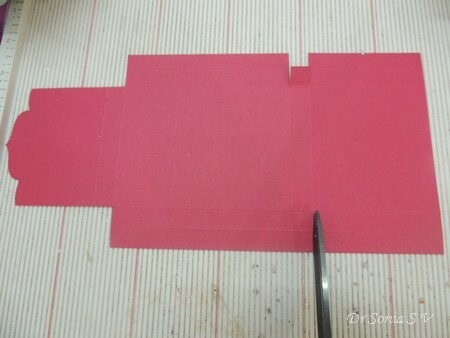 You may trim the 6 x 10 piece before gluing it on if it is overhanging over the sides. While gluing the inner lining...again use a chipboard piece to score along the gaps on either side of the spine to ensure a good adhesion. Now your cover is ready...you can use this to make a mini album , a folding photo-frame[ see Photoframe Tutorial ] or a stationary holder like in this project. How to make a Mini Notebook Holder. Turn it and score 1/2 , 1, 4 1/4 and 4 3/4. 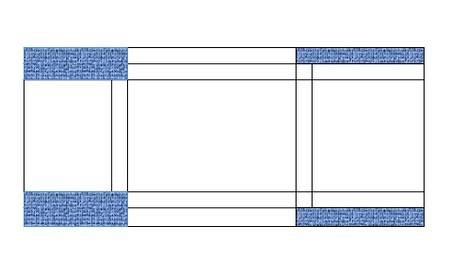 This is the pictorial representation and the blue shaded region is the part you can snip off before folding and gluing. 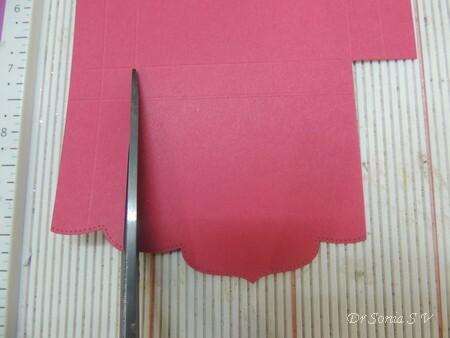 The shorter 2 3/4 inch side will form the top closure flap and if you want you can cut a fancy edge to it. 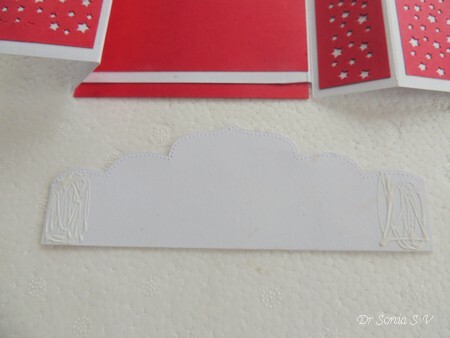 I used a Crealies On the edge die to cut both the card stock and pattern paper for the flap. 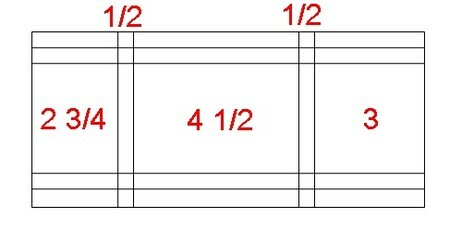 Snip off the side 1 inch borders on the 2 3/4 and 1/2 part....refer to the graphic shaded in blue if you get confused. 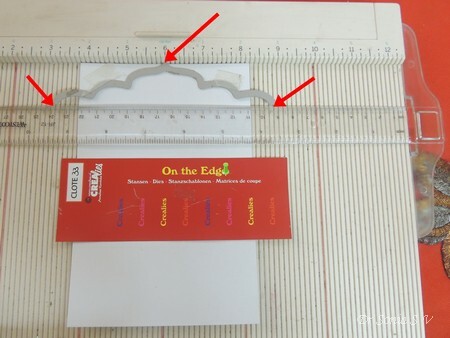 Cut in 1 inch at the lower part as shown and snip off parts as shown in the graphic.Optionally cut wedges/ round off the edges to allow easy gluing. 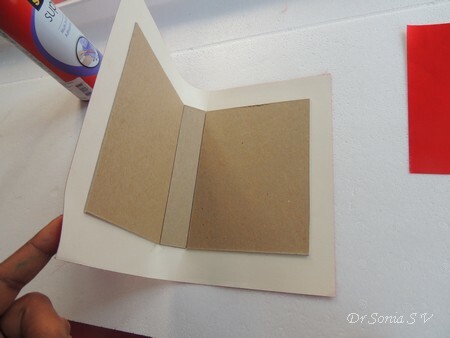 Fold along the score lines as shown and you can see your note holder taking shape. Add a small magnet on the inside of your top flap and cover with pattern paper for a neat finish. 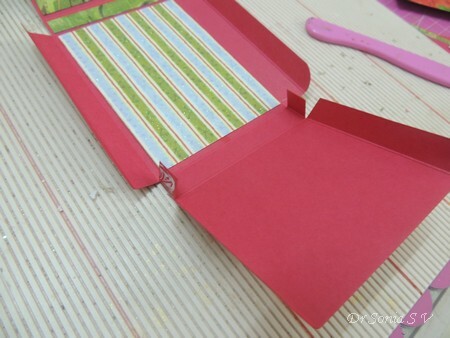 Optionally line the inside of your note holder with pattern paper. 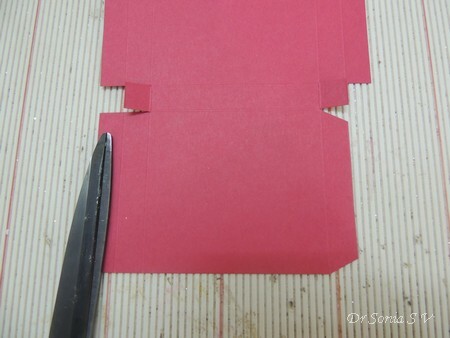 Fold up the lower flap and stick it onto to tiny squares and then glue over the side flaps as shown below. Lastly stick on another magnet on the lower flap adjusting the position to perfectly line with the magnet on the upper flap. 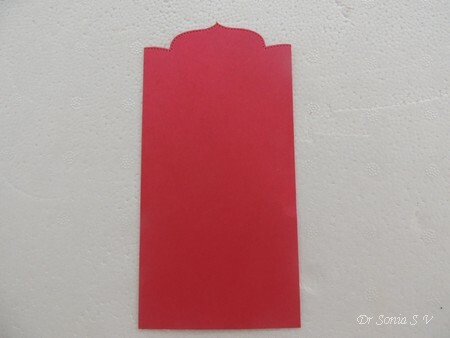 Cover the magnet with pattern paper. 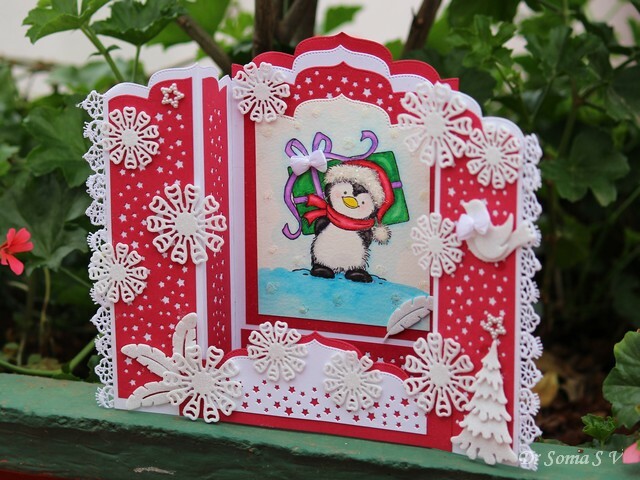 Form a loop of ribbon to snugly fit around and pen ...apply glue and hold with a paper clip till it dries! Stick the ribbon tail under your notebook holder while you stick it to the book cover. I hope you liked this Tutorial and project! 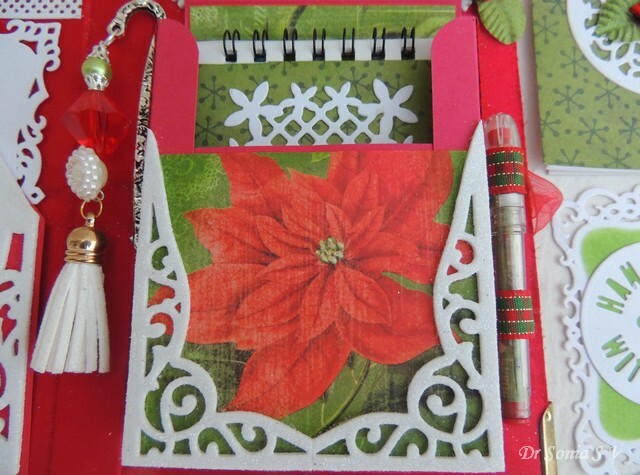 This project is my DT post for Cuttlebug Mania Challenge where the theme is "Anything Christmas with a die /embossing folder"
Hi friends, I have been blessed like many of you to have a hobby that not only makes me happy but helps spread a little bit of happiness!! This post is to share with all of you how generous the crafting community is and to say a big Thank you to each one of you. 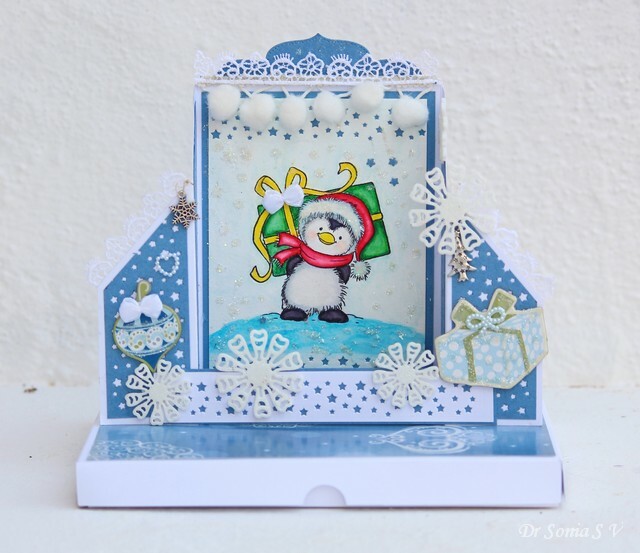 Maria [aka Mia ] is a versatile crafter from Greece whom I became friends with recently. She is multi-talented crafter dabbling in papercrafts, fabric crafts and a loooot of different styles of crafts.Mia has hosted a couple of amazing giveaways recently and I was the lucky winner of a surprise parcel. 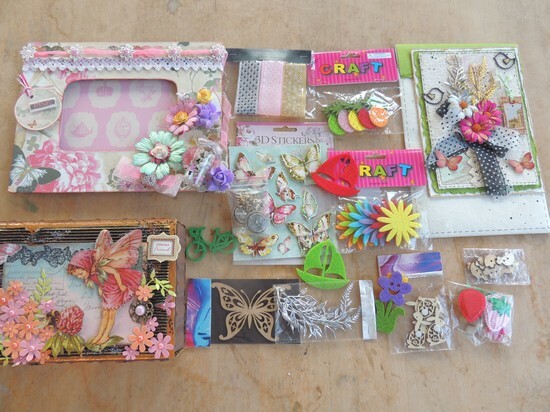 I was so stunned to receive this big box of crafty treasure all the way from Greece . 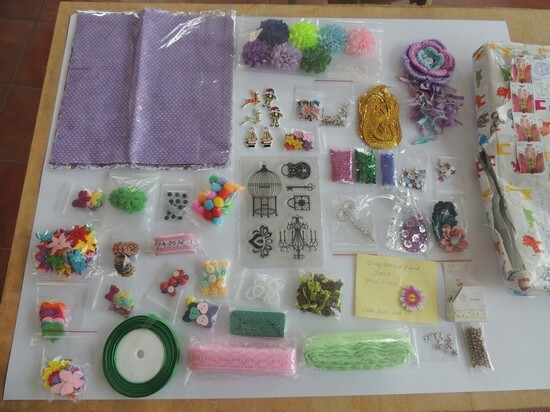 It has the most special handmade crafts , the cutest buttons I have seen, gorgeous rhinestones, felt embellishments, beautiful laces ,fabric pieces,beads, stamps and even metal embellishments. Thank you so much Mia....you don't know how happy your kindness has made me feel!! I bet most of you who visit me know Lisa....the mermaid crafter. Hehe yes I do tend to imagine Lisa to be a certain magical beautiful mermaid who is supremely kind and benevolent!! Lisa not only makes the most beautiful projects but is so generous with spreading kindness by commenting on her friends' blogs. If you are a blogger you will know how precious a comment is! Love you Lisa for who you are!! 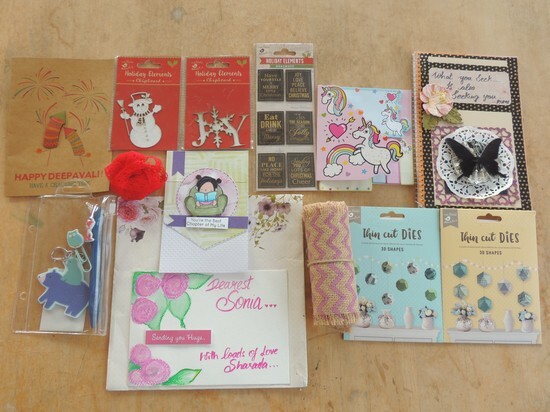 And Thank you so much for the gorgeous giveaway gifts and special card. I have a crafty friend , Sharada whom I have been lucky enough to meet a couple of times since she lives in Bangalore too. Recently she came back from an UK trip and this is what she sent me.Everything handpicked for me including dies... I was speechless!! Many of you may remember I had a huge celebration last year when my blog viewership reached 5 million. 16 people won prizes and my blogger friend Priyanka Mathur was the lucky winner of a Big Shot machine! A couple of months back I was struggling with many things in my life and feeling quite low and then... a huge parcel arrived from Priyanka and cheered me up no end! Money need not buy happiness all the time but yes kindness sure can make someone super happy!!! 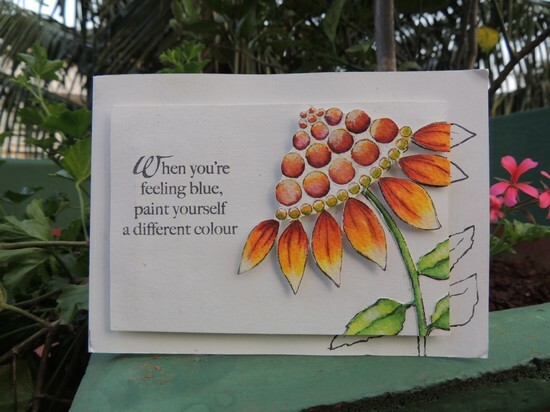 During the same phase when I was feeling blue....here is something special a dear blogger friend Pooja sent me! It made me feel so loved and happy. The power of a little something handmade sure is amazing!! This year was difficult for me during multiple phases and I had not been able to craft or blog and visit all of you as much as I used to and wanted to.But I do treasure each comment, email , message and blog visit ....so much that it is difficult for me to put my gratitude into words and thank you adequately enough!Without perhaps realizing it ,each of you have given me a share of happiness...the most beautiful gift!!! Thank you so much my friends! 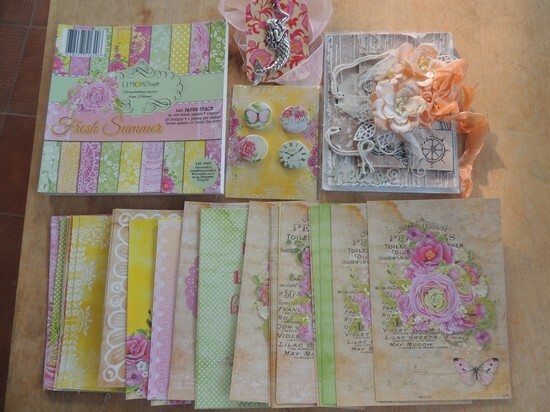 I am thinking of a giveaway soon...it wont be as grand as the one I had during my 5 million pageviews celebration....just a personalThank you giveaway for my crafty pals in blogland.